Remember that you become what you think about. For this reason, be wary of thoughts of doubt. Eliminate conditioned beliefs regarding the impossibility of planned actions. If you can conceive it, you can create it. Allow yourself to wander freely in your imagination. Exclude nothing in your fantasies. Imaginative meanderings form the unlimited river of life. 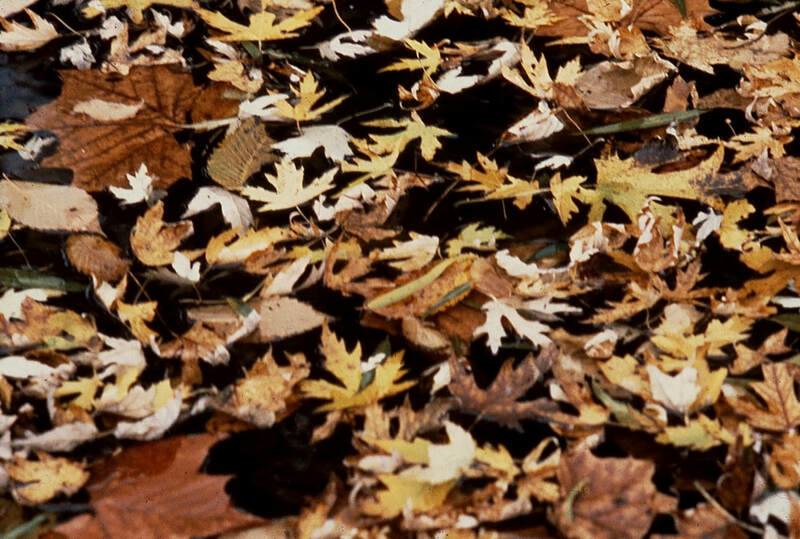 To facilitate these worthwhile meanderings, start thinking about how you would answer the following question: “What doubts or negative conditioned beliefs am I now eliminating?” You may want to focus here on outmoded patterns of thinking regarding so-called universal principles and unwanted notions of integrity generally (rather than just focusing on unwanted aspects of your own individual self). You will have a chance to let go of unworkable aspects of your individual self at the end of the next course. 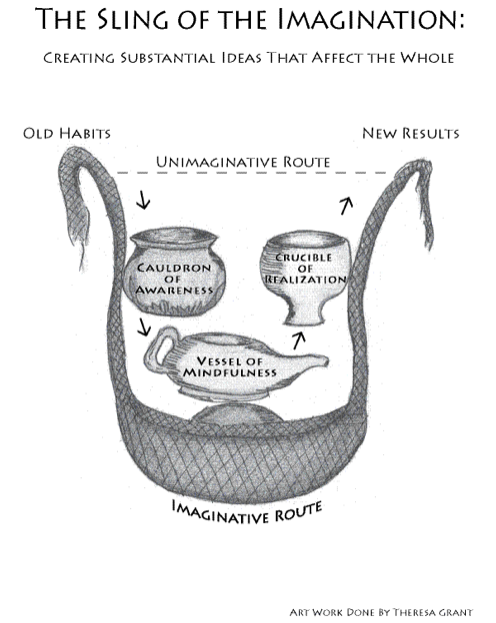 Here, before enrolling in the Heartwood Path: Egos course, where you will identify and secure your own unique personality, come to understand and know how to use the Sling of the Imagination, pictured below. I shall present the ancient sling as a metaphorical model used to illustrate what it takes for you to affect the whole—the whole household, the whole neighborhood, the whole nation, or the whole environment. Yes, like diminutive David slaying the giant Goliath, little ‘ole you can change the big ‘ole world. But first you will need to do some work and grow. There will be many new words, some lofty principles, and some metaphors in this explanation of the Sling of the Imagination. Use these literary devices to help you work your way through this section. Read it carefully, perhaps more than once, and you will come to understand a useful method for making big changes in the world. If you need more help, there are carefully trained guides available who can help you with this or any other part of this series of courses. The Sling of the Imagination is one of the most important tools for you to use to find happiness, protect the beauty of nature, secure environmental sustainability, or make any positive change in society, culture, or the world. We will be using as a metaphor the sling David used in the Bible. Slings are ancient weapons made of many different materials, but all consist of two lengths of cord, fabric, or hide attached to a pouch. Like David who used a sling to slay Goliath, you too are, metaphorically speaking, armed with a sling—albeit of a different sort. The sling I am talking about is not used to pitch a stone to hurt an individual. It is instead a virtual, metaphorical, symbolic one used to cast forth ideas that shift the whole for the better. Remembering David’s words that “The Lord saveth not with sword and spear,” and John Lennon’s lyrics “War is over, if you want it” the stone in the pouch of our virtual sling is replaced metaphorically with personal choice. Like a stone, choice can be used for good or for evil. To make sure your use of the sling is positive and productive, guard against picking solutions based on incomplete information, little or no self-awareness and growth, and no processes of mindfulness and realization, both explained below. I have personal experience going down the Unimaginative Route. My experience mentioned here has to do with the environmental movement. Despite this limited example, the Sling can be applied to any attempt to affect a change. Not knowing a better alternative, the Unimaginative Route, which in its extreme form is but muddling through, was my blind, unintentional course during my days of lobbying and environmental organizing (full-time between 1975 and 1997). Fellow conservationists and myself used this so-called “unimaginative route” to, for example, stop the Meramec Dam nears St. Louis, Missouri, to preserve over 100,000 acres of Forest Service lands by including them in the Wilderness Preservation System (in Missouri and Illinois), to cut the funding for a nuclear power plant in central Missouri, and to lobby for what is (or was) the environmental safety net which includes the Clean Air Act, the Water Pollution Control Act, and the Endangered Species Act. Had we known to take the Imaginative route, even greater victories would have occurred; or, at least, they would have been achieved more efficiently and my cohorts would have learned more about themselves and advocacy in the process. Without the Sling, we muddled our way to accomplishment, too naive to know that there was another way that would have been faster and more far-reaching. I was one of a couple dozen people who used the unimaginative route while lobbying daily in the weeks before the enactment of the second most significant conservation bill in the history of the United States (after the establishment of the National Park System)—the law that preserved over 80 millions acres in Alaska. I was assigned to lobby Midwest members of Congress. From these successes I can attest that the so-called Unimaginative route can be used to achieve important public policy victories. It’s just not the best way because it burns up too many activists and creates less than ideal results—in this instance, not enough inner world support amongst the public that could be used to maintain the vast conservation victories in the face of perennial attempts to seize the protected resources. I call the better approach, the one that involves deep “swooshing,” the “Imaginative Route” because it affords important additions that the Unimaginative Route does not, including: 1) the Imaginative Route helps to improve the spiritual maturity of the environmentalists in the fashion outlined in this series of courses and so it affects positively not just the final outcomes but also the people making the outcomes happen and 2) it provides a way for more significant and enduring positive change. The symbolic “swoosh”––that is, following the Imaginative Route––represents what occurs from the sequence of thinking-to-experiencing-to-doing. With this three step approach, the so-called “swoosh” is personal cultivation, a systematic process of maturation. I believe that had activists in the environmental, civil rights, and other progressive movements used the Imaginative Route over the last forty years, many of the policy changes adopted during the Seventies and Eighties but which are now abandoned, underfunded, or ignored could have been sustained—resulting in a much better world. The predominant use of the Unimaginative Route meant that the activists in the various progressive movements were unable to counter the setbacks in public policy that occurred during the last decade of the Twentieth Century and the first decade of the Twenty-first Century, including the weakening of the Environmental Protection Agency, the election of congressmen less willing to support the preservation of more wilderness areas, and the lack of adequate laws to ensure that all lives—including blacks, females, school children, the disabled, and the elderly—matter. To secure a magnificent future the Imaginative Route needs to be employed at all levels of organization—from amongst those who work at the United Nations to those who decide how to best think and behave in households and neighborhoods. The Imaginative Route of the Heartwood Path ought not to be used only by professional activists. It needs to also be employed in each household so that nearby improvements can be made and so that individual voters will have the inner world intentions and ethics and the outer world individual and group behaviors and physical systems needed to not only vote for the best candidates but also to monitor and, if necessary, alter government programs. A better future awaits as more people undergo the kind of self improvement prescribed here and, thereby, become eartHearts. 1) Begin at the upper left. “Swooshing” the Sling of Imagination begins at the top left of the arc, before the cord of the sling begins to descend. 2) Enter the Cauldron of Awareness. 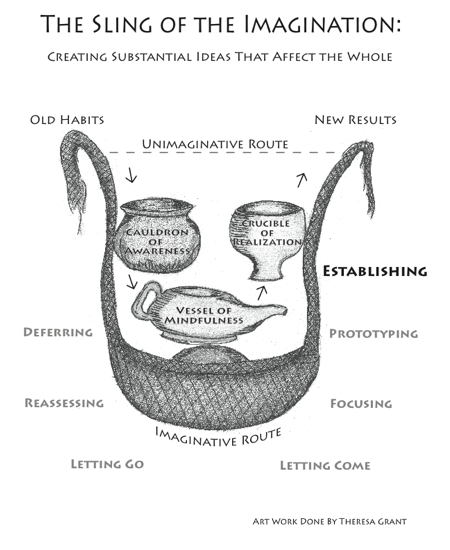 Once the sling begins to descend (into what is labeled the Cauldron of Awareness on the accompanying graphic model), outmoded notions and strategies are deferred, new notions are tested, new identities are identified, and the need to remain static gives way to the forward momentum of the metaphorical “swoosh” of the Sling of Imagination. Control is no longer a matter of staying put. 3) Enter the Vessel of Mindfulness. Toward the bottom of the metaphorical arc (in what is labeled the Vessel of Mindfulness), one lets go of outmoded ways of thinking and identifying, becomes present with the moment, makes choices to serve the evolution of life towards perfect wholeness (with related but differentiated parts) and lets come a larger field of change. Midway between our old ways of thinking and better ways of acting , in the Vessel of Mindfulness, the slinger in reality laments and witnesses what amounts to her own elegy. This is the experience of one’s own requiem. Without a deep” swoosh” through the Imaginative Route of the Sling of Imagination the slinger––the one using the Unimaginative Route–– is likely to fail to let her old self die. If this happens, one will return to one’s previous life. But if the slinger metaphorically “swooshes” through the act of suspending one’s old ways of thinking, through redirecting one’s thoughts to the preservation of the whole, and through letting go so one can let new approaches come, then the metaphorical forward momentum of the virtual arc of the sling in reality is the killing of one’s old life and the propelling of one towards a new heaven and a new earth—a joyous and sustainable future. 4) Enter the Crucible Of Realization. As the symbolic arc of the sling moves upward before release (in what is labeled the Crucible of Realization) one goes through various steps (described in a later Heartwood Path course, entitled “Volitos”) toward the realization of an emerging future. Release—the result of a Personal Choice—occurs at the moment the future emerges. The course of the released “stone” of Personal Choice is determined not just by the nature (the depth) of the metaphorical “swoosh”; but, more accurately and beautifully, through the actual inner nature of the slinger. Rather than the rock used against Goliath, the object in the metaphorical Sling of Imagination is Personal Choice. 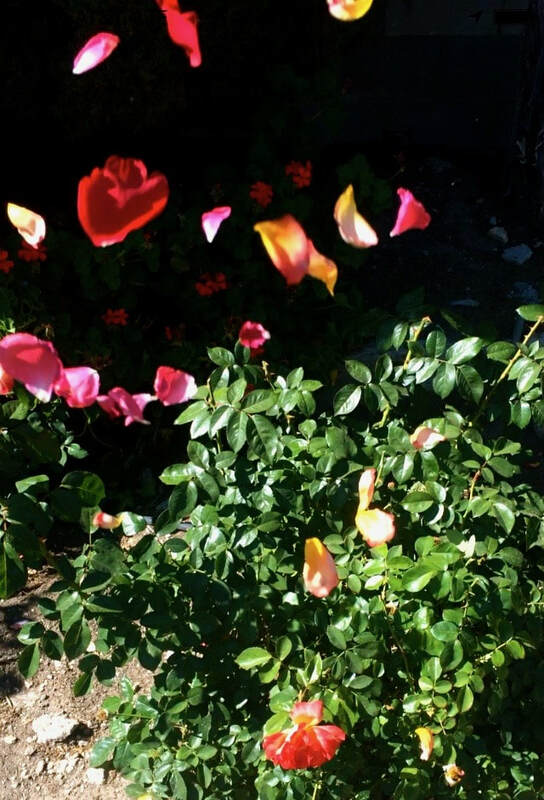 If the choice is to, metaphorically, “swoosh’ deeply—(which in reality means to practice fervent mindfulness and self examination) then after the metaphorical requiem comes a kind of actual mental focusing in the Cauldron of Realization. This metaphorical cauldron allows one to beautifully envision what one seeks to create. After envisioning, which is called focusing in the illustration, one then creates smaller versions of the prospect one is seeking. When one builds prototypes, refinements can occur on a scale that is manageable. Once the prototypes are enacted and revised after evaluations and feedback in the Crucible of Realization, the new becomes embodied, institutionalized, and the metaphorical projectile which is, in reality, Personal Choice continues on its new and improved course. ​It takes a powerful use of the Imaginative Route in the Sling of Imagination—a deep look at Self—to battle the immune system that fights off change and rejects the unfamiliar. Don’t muddle, as we did. It’s too taxing. And the results are often tenuous. Take the carefully laid out Imaginative Route instead. By reading this introduction, you have already taken step one of our four steps. Step Two comes at the end of the next Heartwood Path course—called “Egos”—where you learn what to do in the Cauldron Of Awareness. For this activity, which qualifies as a kind of reassessing typically done in the Cauldron of Awareness of the Sling of the Imagination, list in your journal some activities that make you feel inspired. From this list, determine who in the world is making a living doing such things. Plan how you will model their behavior, making sure you add your own individuality to the work. In making your list of what inspires you, listen mainly to the words from within. Words from without are likely to encourage you to conform rather than to contribute. One cannot force others to change, but one can change oneself. After focusing, one then creates smaller versions of the prospect one is seeking—building prototypes, where refinements can occur on a scale that is manageable. Some of your dreams may actually be the dreams of the world, passing through your dream-time awareness. You are making good progress going down the Heartwood Path, both day and night. As you dream you come across Dream Characters that live in our emotional, non-rational, intuitive, and beautiful nighttime consciousness. Use your nighttime reverie and the Dream Tending that follows it as a way to find happiness and to rebalance your relationship with the world. Sometimes the dreams are our own and sometimes the dreams come from our ensouled living world.That is why it is important to ask: “Who is dreaming?” In asking this question you will likely discover that Dream Images are informed by the subjective inner natures of the things, creatures, our chosen attractive natural beings, and the world. Always remember that dreams do not always belong to ourselves. “They are the expression of Nature herself, effortlessly arising in our dreams (emphasis added)” (Aizenstat, 2009, p. 151). For this reason, look at an often forgotten aspect of your dreams––the Landscape (the Dreamscape, which feeds and enlivens Dream Characters). The Landscape/Dreamscape is the World Dream’s fundamental ground, the setting in which everything in the dream happens. To understand what I mean, pick a dream from your journal, perhaps the one you had last night. Like a naturalist, explore the setting, forgetting for a moment the drama or the characters of the dream. Resist the urge try to read the signs or to reduce the Dream to a psychological phenomenon. Just notice the location of the Dream. It is a living entity, a living place with living Characters, in your inner world. Once your have identified the setting of the dream, explore this landscape by separating it in your mind from the drama or emotions of the dream. Open up your sense of curiosity and close down your assumptions. Follow your attractions, paying particular attention to whatever interests you in a sensual, embodied way. Pay attention to what stands out. Notice how you are not the center of its concern, yet pay attention to how you feel as you wander about. Avoid trying to find meaning at this point. Mostly just pay attention to what comes forth. In doing so, you are taking an important step in becoming an eartHeart secular saint. Before preparing for sleep, think over what you have learned in this course—the Natural Systems Think Process, how to glean guidance from nature, important universal principles, World Dreams, and the Imaginative Route to affecting the whole. After this review, dream. Then, tend to your dreams. After writing down your impressions in your dream journal, you are ready to move on to the next course: “Egos”--covering the topic of individuation. It’s a whole course about you, your gifts, and how not to lose yourself before integrating into the whole. ​All preparations now complete, you are ready to make some big strides towards a happier life, towards the protection of the beauty of nature, and towards a sustainable natural environment. Exactly how all of these results unfold depends on you, which happens to be the topic of the next course. Keep going. You have now completed 117 out of 117 waypoints in Kosmos.